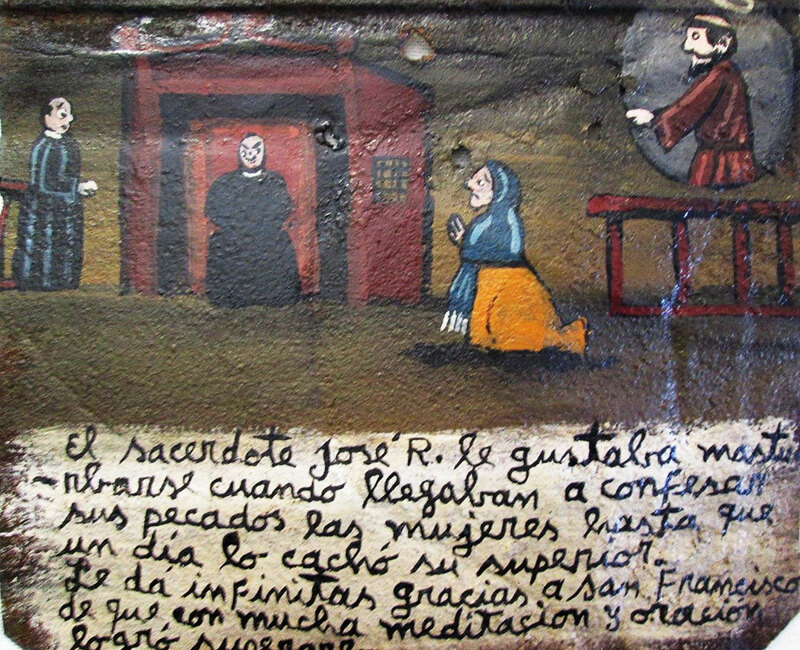 We offer this retablo to the Virgin of Guadalupe because the holy father Fray Tormenta won this fight in order to help the children from the streets and helpless women. They pray for him seeing his generosity and modesty. We entrust him to you, with all our hearts, for his help. A. J. fell in love with a country priest and one day, in a moment of weakness, offered herself to him. 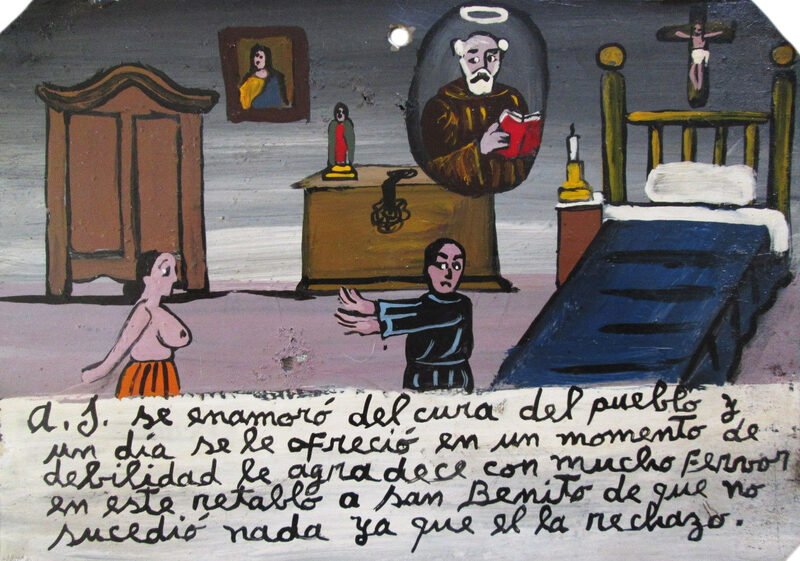 She thanks Saint Benedict with this retablo for nothing happened because the priest turned her down. 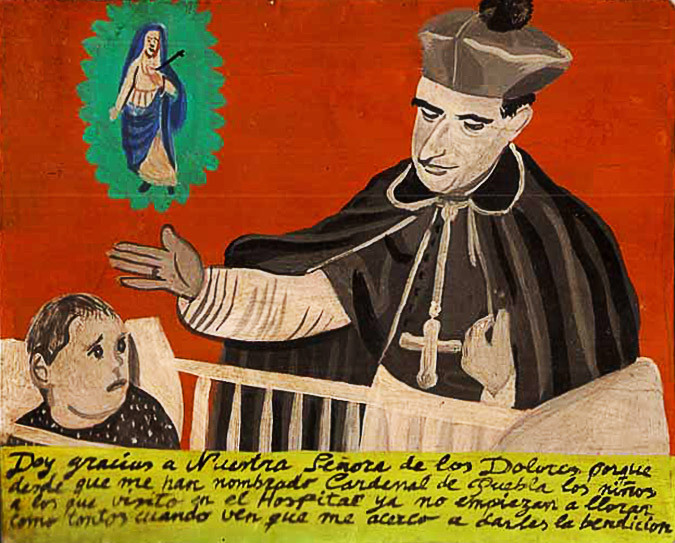 I thank the Virgin of Sorrows, because since I have been appointed the Cardinal of Puebla, the children that I visit in the hospital don’t cry like crazy anymore when they see me coming to give them the blessing. Thank you, Our Father, for letting us get back to the convent. During our mission we were attacked by people who didn’t know any religion at all. However we hope you would forgive them. Our town was always a quiet and peaceful place. But suddenly a true devil nest with tempting she-devils was opened. The she-devils lured our husbands in their damned den and got all their money from them. 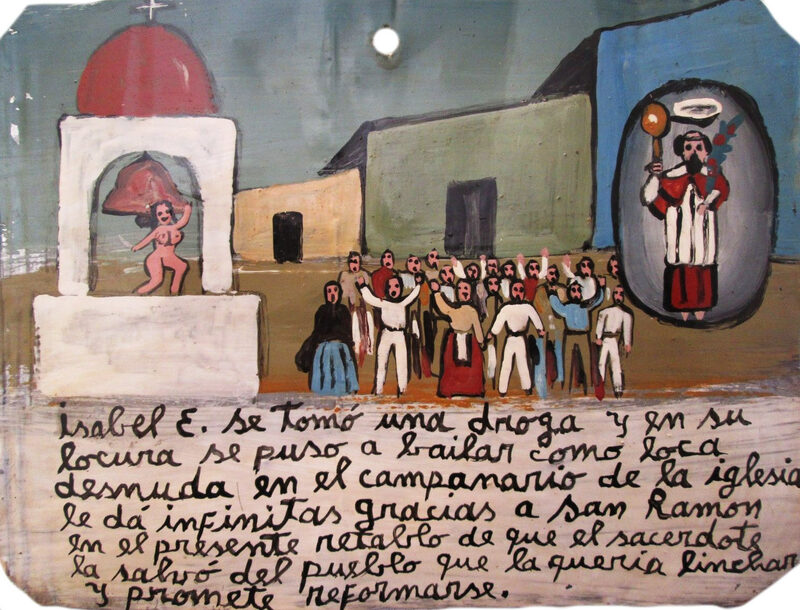 We discussed this with the priest, and one morning, when the place was closed, sprinkled it with holy water. 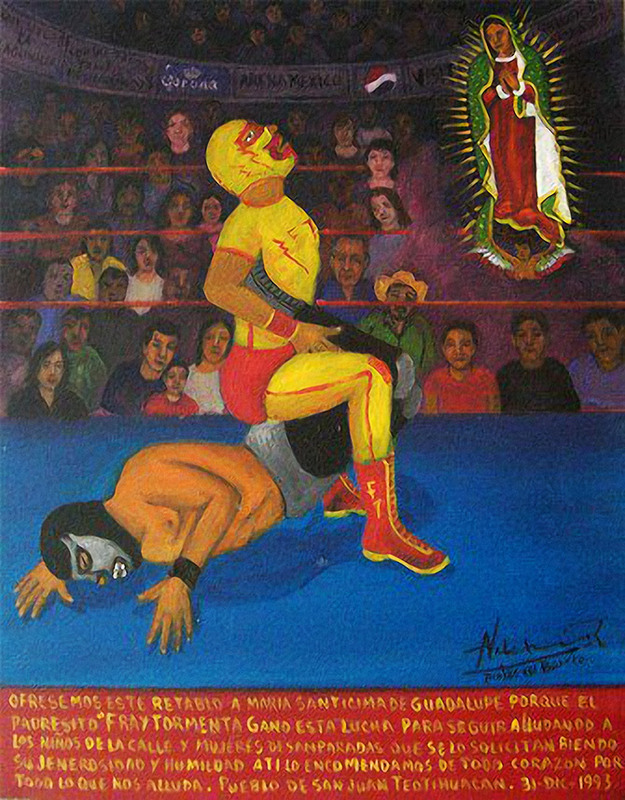 Then we put crosses on the door, and the priest performed an exorcism. Those doors to hell never opened again, and we got our husbands back. We thank for that. 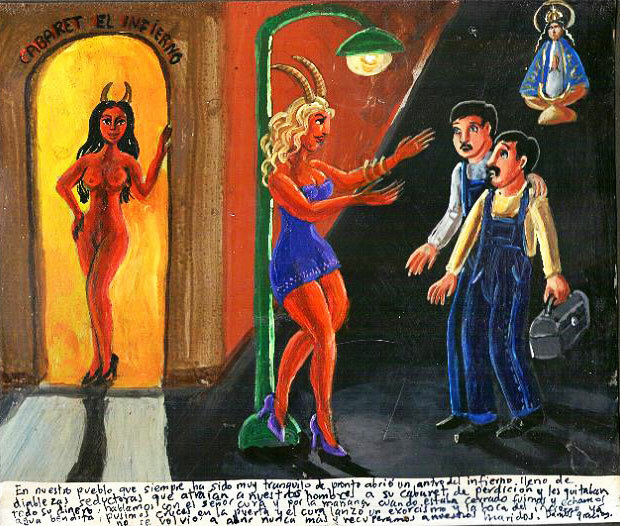 The priest Jose R. enjoyed jerking off while the women confessing him in their sins. But one day his superior caught him. 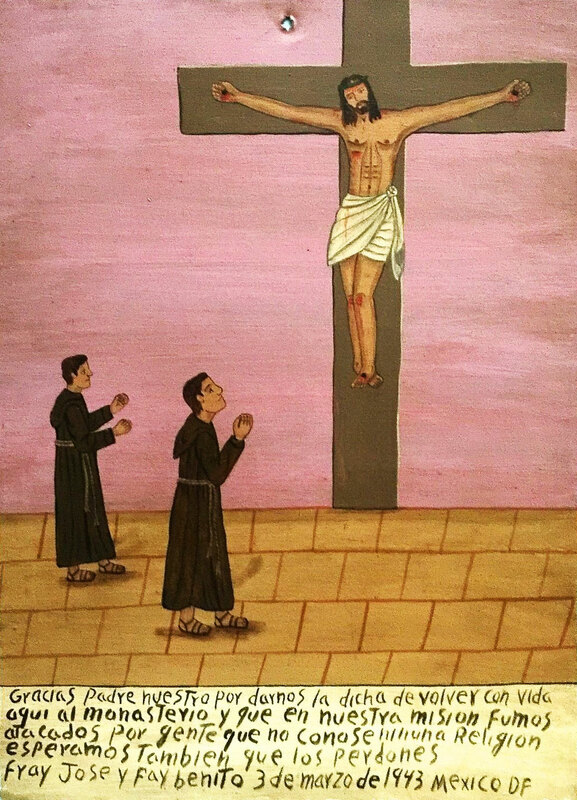 He thanks Saint Francis because with many prayers and a lot of meditation he managed to overcome this. 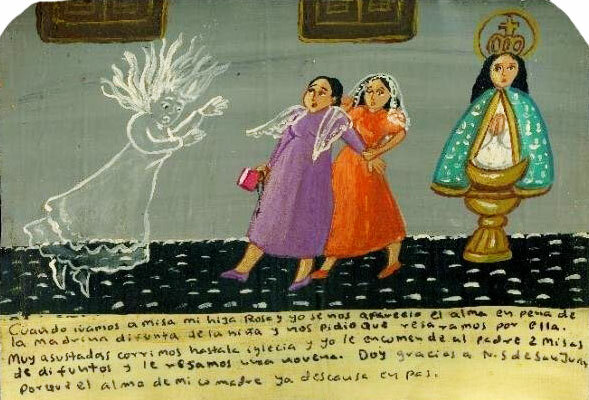 My daughter Rosa and I went to a mass, and the soul of my girl’s godmother appeared to us. The ghost asked us to pray for her. We were scared and ran to the church, where I ordered two requiem masses to the priest. We also prayed a novena. I thank the Virgin of San Juan because my friend’s soul has rested in peace. 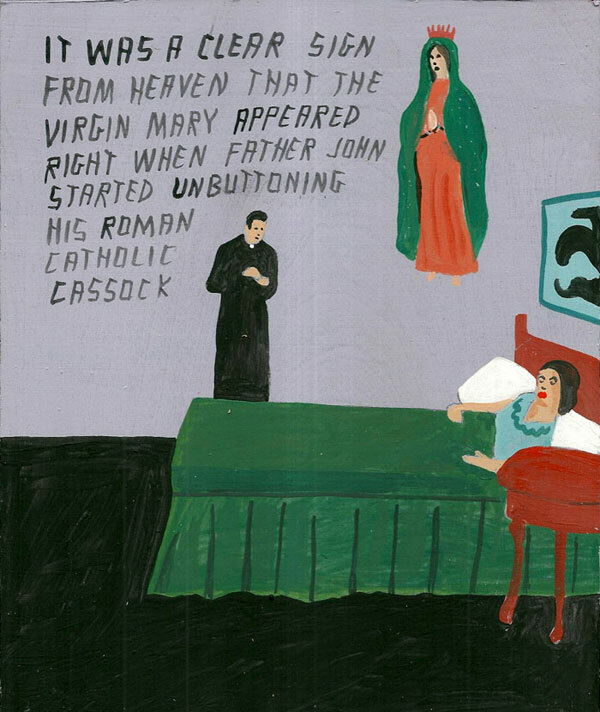 It was a clear sign from heaven that the Virgin Mary appeared right when father John started unbuttoning his Roman Catholic cassock. 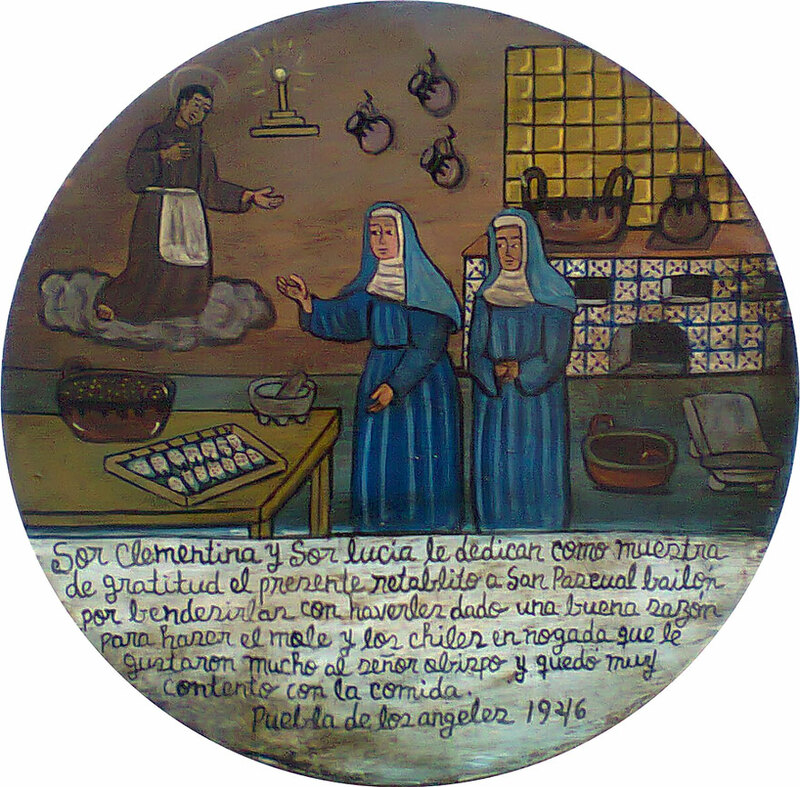 Sister Clementina and sister Lucia dedicate this retablo to Saint Paschal Baylon in gratitude because he blessed them and gave them ability to make mole and chili en nogada that the bishop enjoyed so much. He was very happy with the food. 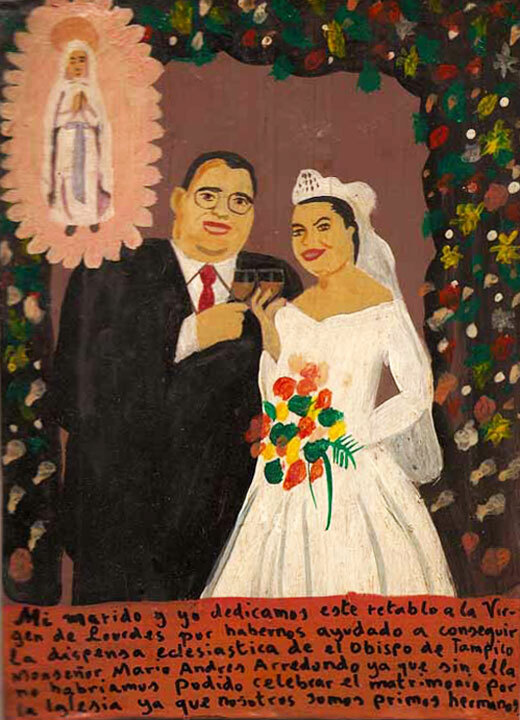 Odilia Coyotl used to sell tamales near by the Church of St. Macarius, and she fell in love with a priest. Some time later he left the church, they got married, and now they even have kids. 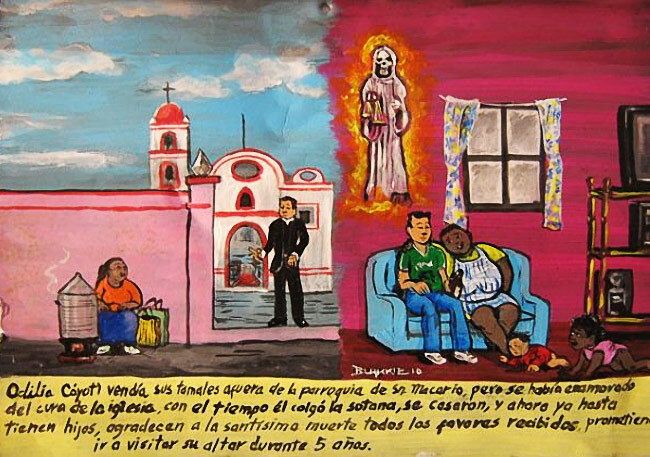 They thank the Holy Death for all the favors and promise to visit her altar for five years. 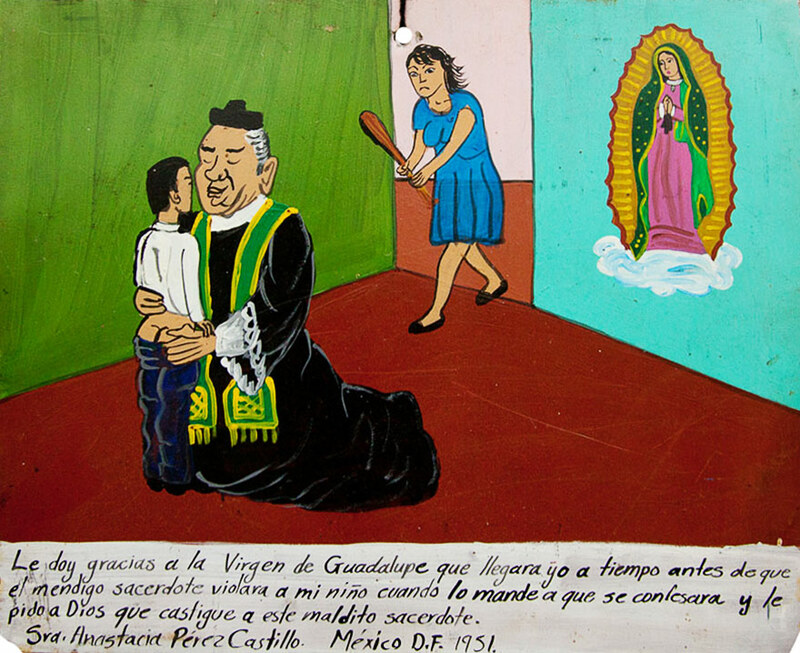 I thank the Virgin of Guadalupe for I arrived right before this naughty priest raped my boy when I sent him to confess. I ask God to punish this damned priest.